The French answer to the mechanical two way switch is the electronic télérupteur. 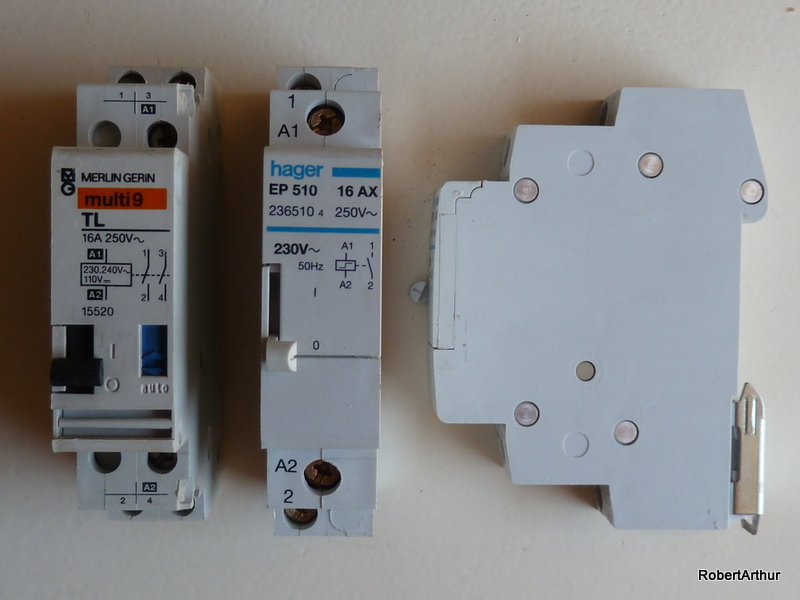 A relay that does the switching, inside your consumer unit, or hiding in a boîte de dërivation somewhere in your house. Activated by two - or as many as you wish - push buttons. How to wire these télérupteurs? 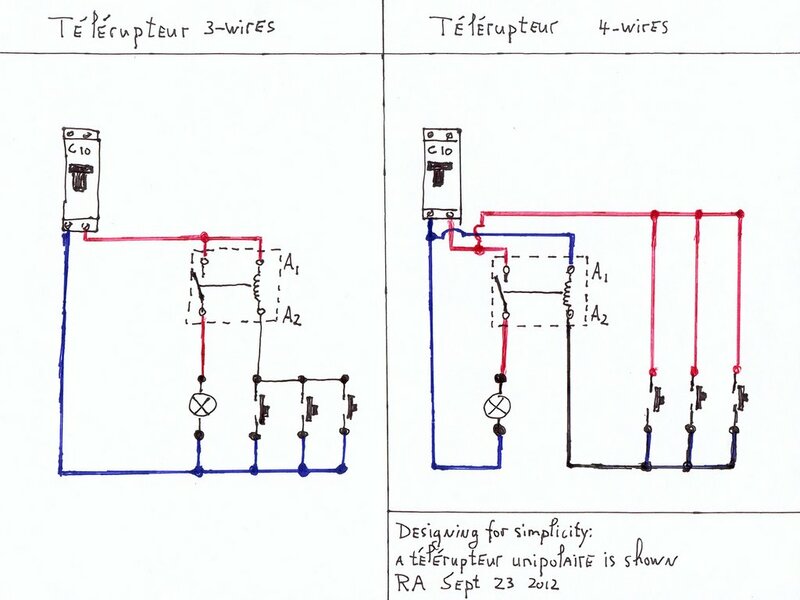 Two diagrams: 3- wire and 4-wire. The obvious advantage of the 3-wire method is less wiring, and you can do it "local": in the neighboorhood of the switches - boutons poussoir - and the lighting. But personally I prefer the 4-wire approach, for several reasons. Not for the first time the telephone rang: Robert, il-y-a un problème ici avec l'éclairage. Went over, and finally discovered, after constructing a pathway in the attic with beams and floorboards, an open boîte, et le voila: a suitable case for treatment, a télérupteur with a burnout. The familiar block type, for use in boîtes that take you sometimes hours to discover where they are hiding. But looking at this picture: they have been lucky there, could have started a fire. And they would have noticed it much too late: no early warning smell of something going wrong. 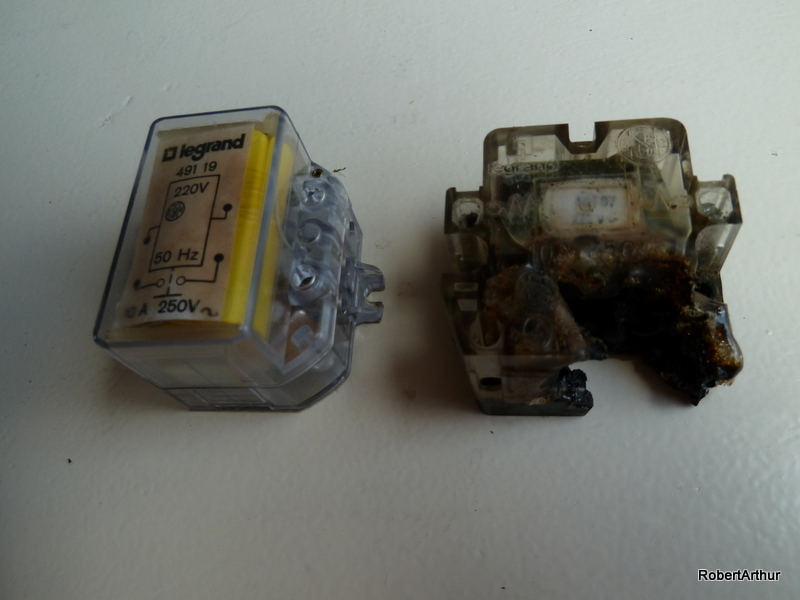 That's one of the reasons why I prefer the more expensive 4-wire method, with télérupteurs in the consumer unit. Easier access, and with the benefit of an earlier feedback (smell) if something goes wrong. Why did it go wrong in this case? Perhaps overheating because of a too high contact resistance, almost loose connection. You should not try to overtighten, but some force required. And in this case possibly a combination of factors: there was also a prise commandée connected to this circuit, not anymore now. Only for lighting purposes, but not everybody knows. It is easy to overload such a télérupteur of only 10 amp, feeding such a special socket. Only for lighting and not more than 300 watt, and not for electric heaters. I've had both the three (remote) and four (consumer unit) wire devices and they were all a pain. The ones in the consumer unit became blackened and didn't always switch out correctly. All of them hummed a lot. I swapped out some and re-wired other so that I didn't have so many 3-way and 4-way switches. I've since moved and deliberately wired the house without the need for these because they are a pain. Dave, so far so lucky, but no problems with the Hagers, MerlinGerins and Schneiders I installed. The modular types for the consumer unit, rail mounted. There are brands I don't touch, the el cheapos in the brico sheds. Noise: it is a mechanical relay inside, and some are noisier than others. There is an electronic child these days, called an interrupteur silencieux. Burnout: these télérupteurs don't like overloading at all. You can overload the switch contacts, and you can overload the coil of the relay. A push button that gets stuck will gradually warm up the coil windings, until the thin coil wiring acts as a fuse: it melts somewhere. Damaged beyond repair. Good quality télérupteurs and boutons poussoir can help prevent the problems you described. But even then, it will never be as reliable as a simple two way switch. The French invention offers more convenience when using three or more switches. A télérupteur is a relais bistable. A latching relay. A conventional relay requires power to keep its contacts open (or closed). A latching relay has to "stable" positions, one short pulse is enough to change position. No current needed in between. The traditional relay is very reliable, the mechanical complexity of the latching relay makes it vulnerable.